Sometimes a recipe just needs a little something. You don't need a spice that can overpower your taste buds, but just a little something that can bring the flavor profile to a new level. For me and my family, we have a new great secret ingredient - jenkins jellies Hell Fire Pepper Jelly. jenkins jellies Hell Fire Pepper Jelly is vegan, organic, gluten free condiment. Born out of Hillary's (one of the creator's) secret garden, this condiment is designed for a variety of uses. From marinades to an easy stir-in for cream cheese and crackers, the Hell Fire Pepper Jelly should become a staple in your seasoning cabinet. The most important thing to remember is to STIR before you use. I'm sure that some of you may be worried that Hell Fire Pepper Jelly may be too spicy for your tastes. The best part of this condiment is that you can control the amount in your recipe. Of course, there is heat, but it doesn't overpower your mouth. It's just enough to bring out the flavor in a dish. I've been using jenkins jellies in a variety of settings in our house. First, we served the easiest preparation (a couple of spoonfuls mixed in cream cheese on crackers) to all the football watchers in the basement. The guys really liked the combination. It was good snack for the guys. Plus, my husband could fix it himself. Second, I came up with a somewhat unlikely preparation. I was making butternut squash soup. My soup was ok, but it needed something. So, I put a couple of spoonfuls in the soup that I made. It instantly brightened the soup. No longer was it bland; instead it was a well balanced combination of sweet and heat. On the jenkins jellies website there are tons of recipe suggestions. Plus, there is a recipe contest for the Hell Fire Pepper jelly. 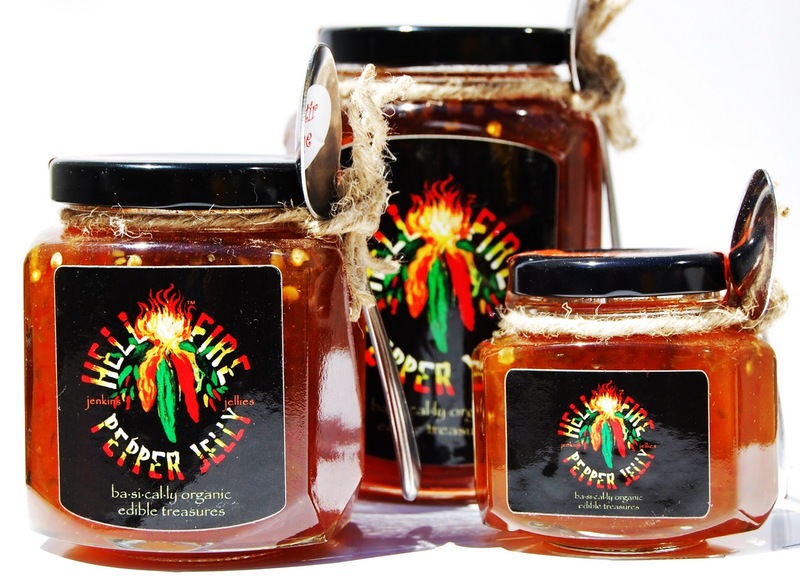 You could win a great prize pack for your recipe using jenkins jellies Hell Fire Jelly. jenkins jellies Hell Fire Pepper Jelly can be purchased on-line at www.jenkinsjellies.com or at Dean & Deluca in New York. For more information on purchasing and pricing, please with the jenkins jellies website. Also, a portion of the profits from the sale of jenkins jellies are donated to GreenWish.com and the Bruce Paltrow Oral Cancer Foundation. So this holiday season, ditch the bland hors d'oeurves. Use some jenkins jellies in your recipes and wow your guests. Disclosure: jenkins jellies provided me with jar of Hell Fire Jelly to try. Also, the company is a sponsor of the Winner Wonderland giveaway event. All opinions are 100% mine and have not been influenced by any person or entity . For my complete disclosure policy, please visit www.more4momsbuck.com/disclosure.